Winter 2017. I was at Jersey airport in the Channel Islands, waiting for an EasyJet flight to London Gatwick. From London, I was booked on a flight out of Heathrow to Singapore that night. Boy, was I looking forward to some tropical weather! EasyJet has a great app where you can watch your aeroplane tracking towards you. Despite the fog that had descended upon Jersey, EZY891 was approaching for landing. Then, suddenly, it aborted the landing and began circling the island. This was not good. If my plane could not land, it would have to return to London. And I’d miss my international flight. After two more attempts at landing, to my horror, I saw the plane climb again and head back to London. That’s the thing with fog — if you can’t see the runway, you can’t land. Not dissimilar to the business model that airlines face. There are a lot of factors that impact the business you just can’t predict. More on that in a moment. Since I fly Air NZ, I’ve always wanted to own a piece of the airline [NZX:AIR]. I thought this might be a good opportunity. I like the dividend, which over the last financial year has been delivering over 9% gross. Now, at the time of writing, the share price is down over 10%. Buffet’s remarks have remained in the back of my mind. I still bought EasyJet [LSE:EZY] in 2016 following its Brexit vote price plunge. It paid a good dividend, and the price recovered quickly. EasyJet is a bit different to most airlines, since it has over 60 million return customers enjoying its low-cost fares. At the time, I was one of them and could see the efficiency and quality of the service. 60 million return customers puts you in the same league as a major utility business like a European electrical network. It’s beyond your regular regional airline. So maybe the usual rules don’t apply. So, what about Air New Zealand? Air NZ is strong when it comes to customers, carrying just under 17 million in total for the financial year ending June 2018. And it appears to be growing. Those numbers were up 6.4% year on year. The other reason I like Air NZ is that it’s around 52% owned by the government. The demise of a company you invest in is always a concern when seeking to preserve capital. With the government as a major shareholder, this helps allay some fears. Last year, Air NZ had pre-tax profit of $540 million. The guidance this year (June 2018–June 2019) is $340–400 million. That’s up to 37% lower. For one, there’s the impact of the Rolls-Royce engine issues on the Dreamliner planes. This has affected Boeing planes used by all airlines. No doubt, Air NZ has a case for compensation, but that won’t come through in this financial year. More concerning is the softening global outlook. Capacity growth is projected at 4%, the lower end of the 4%–6% guidance that was originally given. 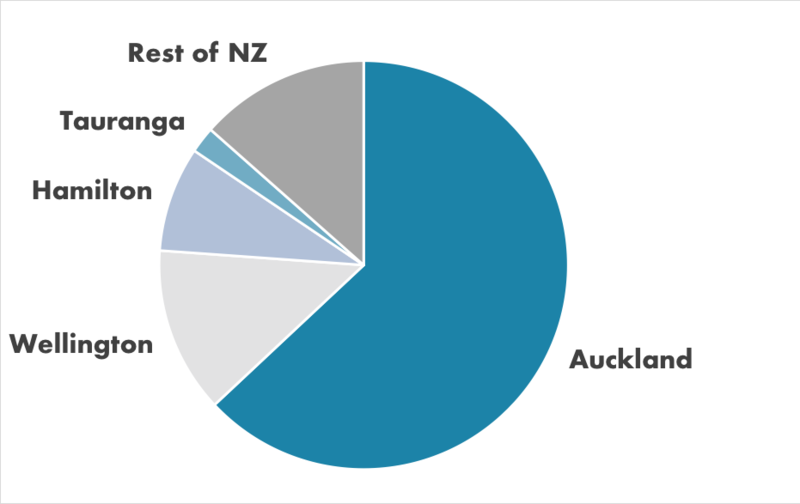 Our two largest sources of inbound visitors are from Australia (1,474,800 arrivals in 2018) and China (448,928 arrivals) according to Stats NZ. Right now, Australia looks like it’s about to undergo some serious housing stress. It has high debt levels on a falling property market. Some of those risks exist in our own market. Meanwhile, China’s giant economy is slowing. That decline seems to be spreading across Asia. Not only is growth slowing, but public and private debt on an oversupply of infrastructure projects may be coming home to roost. If there’s one thing that can bring down an economy and halt travel, it’s unmanageable debt. If that trajectory continues, there could be more softening in Air NZ’s passenger numbers. Despite the drop, the stock still seems a bit expensive — trading at the upper end of its five-year range. Mind you, that could be said for most larger caps on the NZX these days. I worry about thin margins and the ups and downs of demand for travel in an increasingly volatile global economy. However, one thing I am confident on is the long-term growth in demand for aviation. My regret is not buying Boeing [NYSE:BA] before the Trump tax cuts. The share price has soared, virtually doubling since 2016. If the company goes ahead and builds the 797, they’ll find demand and possibly even more growth. Although there are risks when rolling out a new airliner that will likely sell for somewhere between US$60 million to $100 million per plane, Boeing has an exciting future. Rest assured, here at Money Morning NZ, we’ll keep tracking developments and opportunities in this growth sector of travel and aviation. Simon is a contributor to Money Morning and has been investing in the markets since he was 17. He recently spent a couple of years working in the hedge fund industry in Europe. Before this he owned an award-winning professional services business and online learning company in Auckland for 20 years. He has completed the Certificate in Discretionary Investment Management from the Personal Finance Society (UK), has written a bestselling book and manages global share portfolios.